vSphere 6.7 is the efficient and secure platform for your hybrid cloud, offering more applications and greater security with the introduction of TPM 2.0. 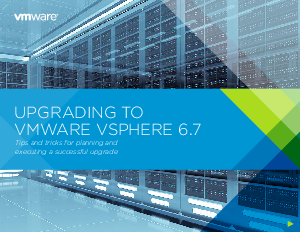 If you’re ready to make the switch, this eBook is here to help by breaking down each phase of the upgrade process to 6.7. We’ll also explain all the key new features of vSphere and give you handy tips and trips for executing a successful upgrade. Please enter your details to access the eBook.